My blog post a couple of days ago about DI.se’s poor website UX was really just one example of websites that make use of “modern” features while failing to actually make them useful. 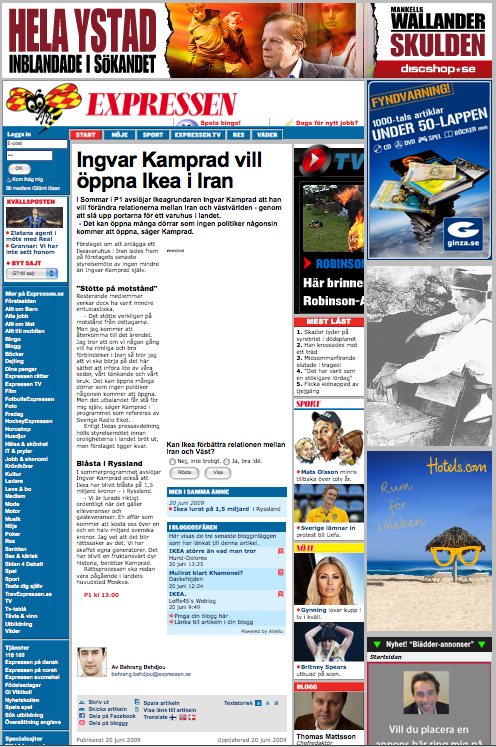 expressen.se is another example, but for other reasons. Similar to DI.se, they have a toolbar section for each article with functions like changing the text size, printing the article, and even fancy things like sharing the article on Facebook. The problem is that they choose to have this toolbar at the bottom of the article, not at the top! Granted, some of these functions are likely very rarely used, and only meaningful once you have actually read the article (such as sending an article link through e-mail), but changing the text size is something you will want to do before you start to read the article, not after! Click on the article link you want to read. Scroll down to the end of the article (usually somewhere in the middle of the page due to the typical display of the main site content after the article. Click on the a a a toolbar buttons to select your desired text size. Scroll back up to the start of the article and start reading. To make things even worse, expressen.se, just like DI.se, doesn’t remember the text size chosen, so you have to repeat this procedure for every article you read. Why are these things so hard for website designers to get right? Remembering the text size is as simple as storing and reading a website cookie. Even I managed to do it on the ancient Phoenix Help website back in 2002, so why are so many modern news sites still struggling with it? This entry was posted in general and tagged di.se, expressen.se, usability, ux, web design, website on 2009-06-20 by David Tenser. Because the people who use and need those features are not the majority. In my experience way back when I used IE, if I came across inaccessible sites, I had to just move on. As sad as that is, it is (obviously) still a major problem for some people but for the most part, with Firefox and add-ons for it, I don’t have to miss out on what the rest of the World sees and has access to. I still come across sites that I just can’t beat and use, but instead of just moving on like I used to, I try and make an effort to bring awareness of the issue(s) to the site’s owner. Sometimes it’s futile like when it comes to Adobe. They’ll only change their ways and stop discriminating when forced to by a massive law suit, but I have to at least try especially for others who will run into the same problems when visiting an inaccessible site after I do.